A new range for Fleetwood in 2006 … These 21st century Clubmans are descended directly from the Fleetwood Colchester range, the marque that has made Fleetwood famous for over 30 years.. 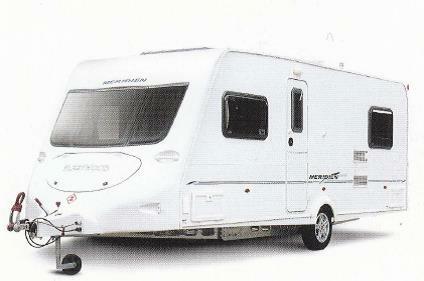 The Meridien was only produced for four years as Fleetwood ceased trading in 2009. The 2007 Meridiens build on the impressive launch that they made in 2006. Highly individual layouts have been redesigned and the stunning exterior styling complements perfectly the interior feel and flair of a quality and distinctive Clubman touring caravan. 2008 saw the introduction of a twin-axle - the 640-EKB (a six-berth, twin-axle) - and Fleetwood stopped producing of the 560-6L.